Educational Qualification: Contenders must be passed in Post Graduate Degree in Psychology with a specialization in Industrial/Organizational or M.tech or M.E in mech/civil/electronics with minimum 55% marks from recognized University. Limit: Candidates age limit should be between 21 years to 30 years as per the IBPS Rules. Educational Qualification: Aspirants must Have Qualified in graduation Degree in CSE/EEE/ECE/Law/Agriculture or Post graduation Degree in Hindi with English subject in degree level form Recognised university they are eligible for this Posts. Age Limit: Aspirants age limit should be between 20 years to 30 years as per the Rules. 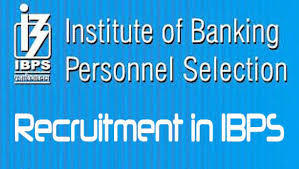 Selection process: Selection of the candidates will be made through Prelims Exam, Main Exam, and personal interview. Examination Fee: All Eligible Candidates need to pay the Examination Fee Rs. 100/- for Sc/St candidates And for others Rs.600/-.